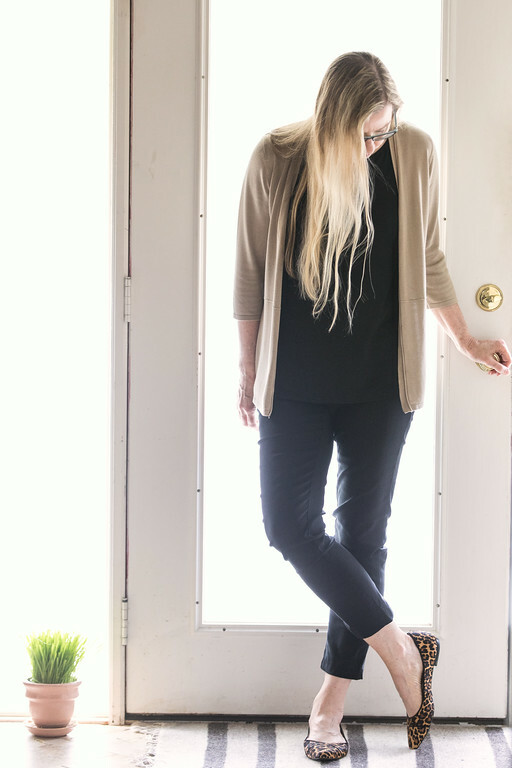 Making the transition from summer to fall by adding some animal print in this outfit of the day for Fashion Over 50. post may contain affiliate links. One of the first things I noticed in my fall capsule wardrobe were the leopard print mules. I am a huge fan of animal prints – leopard and pony (and what’s the difference?) I love adding just a little of it, mainly with scarves and shoes. These leopard flats are Nine West that I found at Marshall’s. They were the perfect addition to this outfit to give it a little more fall feel. I based this outfit on the French Minimalist Summer Capsule 2107 outfit #89. All I did was substitute the leopard flats for the black sandals. They coordinate perfectly with this outfit. I think the fact that I stayed with the French Minimalist Capsule for Fall instead of switching to the Fall Essentials, will make the transition from summer to fall even easier. The colors are the same – black, white (or ivory), gray, and beige. I don’t know how it is where you live, but here we have fall in little bits and starts. One day is gloriously fall and then next day it’s blistering hot. So, having all of the same color palette is going to make this flip flopping easy. This outfit was put together with the cardigan and pants from Steinmart, black tank from TJ Maxx and the leopard flats from Marshalls! Shop some of my favorite leopard flats: Leopard Flats, Leopard Loafers, and Leopard Mules. Follow my capsule wardrobe journey – Capsule Wardrobe. I love that you swapped out the black shoes for the leopard flats! This is such a fun fall look! I love animal prints, especially leopard, although I have a soft spot for zebra too. I need to restock though. I left my only leopard print scarf at a cookie exchange party last December and the host is pretending she never found it. Zebra! Now, all I can think about is finding some zebra print! I have some leopard flats that I love to wear in the fall! Pretty look! 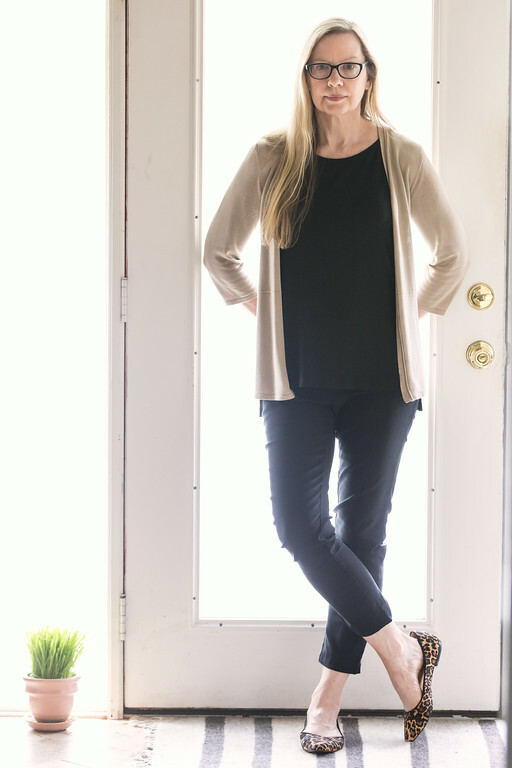 Love the cardigan for transitioning to Fall and your shoes are sweet! I’m living in the cardigan!